It doesn’t matter whether you’re moving for the first time or if moving has already become routine – Moving is usually stressful and uncountable details have to be considered. But, it doesn’t have to be like that. Moving with MOVU is like child’s play: easy, uncomplicated and stress-free but still cheap and safe. Easy Service: Home visits are out. In this digital time and age virtual home visits become possible. Just upload a video or fill in an online inventory list and our moving companies will be able to estimate the exact amount of effort the move is going to take. Cheap: You get 5 offers from moving companies. All the offers are based on fixed prices – that way you can get an overview on market prices. Also, our service is completely free of charge for you. Secure: Our moving companies go through an admission process. All the companies are insured and certified. That way, you only get offers from good companies. Even though Switzerland is a small country, the cantons, cities and villages differ quite a lot. Just to mention one aspect: Switzerland has four official languages, and let’s not even talk about dialects. That’s why we support local moving companies. 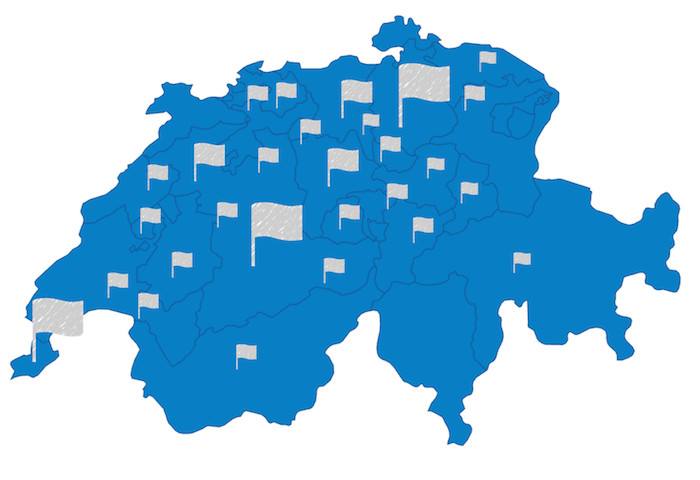 Although we’re not quite represented in every city yet, we already work with over 80 certified moving and cleaning companies in Switzerland. No problem. Our service is free and non-binding, so you can just start an inquiry and fill in the inventory list. Within one workday you will receive 5 offers. If you’re not interested then, it’s no problem, but maybe the prices are even better than you expected? So just start an inquiry now. Redirection order – It’s good to use the online service in order to arrange a redirection order. That way, you don’t lose time driving to the post office and on top of that, it’s cheaper. Inform organizations and sign off – Let the registration office, mobile providers and social security know about your move. Sign off from phone, internet and TV providers and don’t forget the traffic office if you own a car. Apartment handover – Agree on a time and date for the handover at least a few weeks before the move. Usually the handover takes place on the last day of the tenancy or the morning after. Housewarming party – After settling down a bit, don’t miss the opportunity to invite some friends and acquaintances over for a party. Start an inquiry and receive 5 offers from moving companies from your region – tomorrow. Enjoy a completely stress-free move with MOVU.